The 600 has a very similar feel to the 100/200 products. It stores files in RAM and lets you open files by using the arrow keys to select the file and pressing Return. Modem and printer cables are interchangeable with the 100/200. However, the increased size and price (and the untimely appearance of MS-DOS laptops) made the 600 a flop in the marketplace. 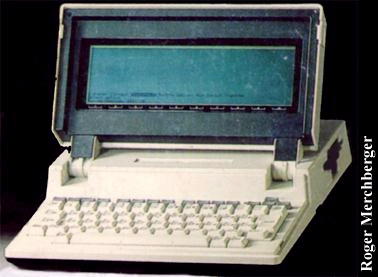 Approximately 20,000 to 25,000 units were manufactured, making the Tandy 600 a rather rare machine. Strangely enough, the Radio Shack store catalog lists several accessories still available for the 600, including the BASIC chip and a service manual/programmer's reference. Microsoft Works made the 600 a more capable machine, in many respects, over the Model 100/200. WORD replaced TEXT, and provided support for margins, indents, and pagination (but not for underline or bold). Works also included FILE (a database) and CALENDAR (a scheduler and alarm clock). Like the Model 100/200, the 600 has a built-in 300 bps modem, but sports an improved version of TELCOM with XMODEM file transfer and a partial VT52 compatibility mode. The RS-232 port is easier to configure and supports data rates up to 19,200 bps (practical maximum throughput is about 2400 bps). The 600's TELCOM has a built-in mini-BBS program that lets people dial in and upload or download files. PLAN (Multiplan) came on a snap-in ROM chip. You can replace PLAN with the optional BASIC chip, or (if you have expanded RAM) copy one program or the other to RAM if you need both available. The Tandy 600 BASIC is very similar to GW-BASIC, but with the glaring omission of commands like INSTR, PEEK, POKE, and VARPTR. However, you can extend the interpreter using library files. A DBCALLS library for handling FILE (database) files was included on a utility disk; some enterprising hackers created a UTILITY library (with PEEK, POKE, and VARPTR) by modifying the DBCALLS.LIB file. The Tandy 600 is my traveling companion and thunderstorm computer. I bought it (serial number 51011265, manufactured Oct. 1985) for $40, after a fellow ham radio operator bought it at a hamfest and learned that it wouldn't run MS-DOS. I had to replace the NiCads and take care of a mis-aligned disk drive cable, now it works quite well (especially when the light is strong enough to make the LCD readable). I created a Tandy 600 FAQ in December of 1996 and posted it to comp.sys.tandy. Other owners responded with corrections and additions, and now we have a Web page, an FTP site, and a mailing list. Several people have expressed interest in creating new software. The 600 lives! Click here to view all comments for the Tandy Model 600 and to leave your own.